We can help you with everything you will need for your event, including tables, chairs, tents, Hors D’oeuvres, entertainment and best of all-Food! Tell us what kind of menu you are looking for, or let us customize a menu for you. 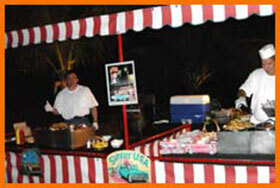 Catering by Joel’s Place has been doing business in South Florida for over 20 years. We have a reputation as leaders in the industry. We are members of the South Florida meeting professionals and the South Broward business club. 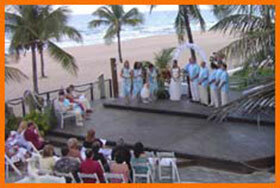 CBJP has done events for every type of clientele. We pride ourselves on our service, it cannot be matched. 2. VALUE: When you compare the quality and quantity of our product, you will agree we offer the best dollar value. 3. INTEGRITY: We stand behind our name and product. 4. DELIVERY FLEET: Our Trucks are custom designed for our specific off-premises catering. 5. REPUTATION: It speaks for itself, but ask around anyway. Our track record is impeccable. 6. FOOD: Yes the food! IT’S GOOD….REAL GOOD! That’s why we love to do tastings — you should know what you are paying for! Rafael: Owner of CBJP and in the business over 20 years — he was taught by the best (Joel), and it shows. You will see him at all the jobs-not just overseeing but working. He will answer any questions that you may have, and he will make sure that you do not have any worries. Rafael is one of the hardest working bosses you will ever see. 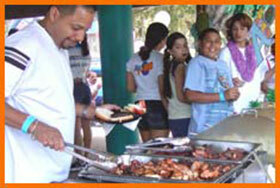 Hector: The head chef of CBJP and has been with us for over 15 years! Call or come by and get to know us, and let us show you why we should cater your next special event!